ALEKS – Assessment and LEarning in Knowledge Spaces – as described on their website, is “a web-based, artificially intelligent assessment and learning system.” ALEKS is a great math program that adapts to your child specifically. It determines first-off what your child already knows by a placement assessment. Then, you and your child decide what to learn next on the list of topics your child hasn’t mastered. As your student progresses through the course, additional assessments are given to determine subject mastery. I used ALEKS primarily with Patrick, my blessed dyslexic. He is in third grade and has already mastered several third grade concepts (math and otherwise). He still can’t read independently, however, so ALEKS was a challenge for him. How? Isn’t it a math program?? Yes, it’s thoroughly math, but the student needs to be able to read the explanations. The program is great and the only thing I could have wished for was that the explanations were audible as well as visual – then I could have turned Patrick loose to learn as he pleased. Instead, I had to sit with him for the concept explanations. Again, though, the program itself is terrific! One thing that I appreciated about the program is that it is very visual for the student. Patrick was able to see a visual representation of his progress – he was presented with a pie chart that was broken down by concept and then colored to represent how much he had mastered and how much he had left to learn. The pie chart alone was a great incentive for him to do more. Another part of the program is QuickTables. QuickTables is an easy and fun way for your student to master their math tables – addition, subtraction, multiplication, and division. Again, they are given a primary assessment for each of the tables, and then their practice is adapted to what the individual student needs to learn for mastery. The games are fun, engaging, and easy for the student to maneuver alone. Patrick, who is in third grade, is easily able to move around in the program and input the answers himself – even the fractions. There is so much content available through ALEKS. The program ranges from 3rd grade to 12th, including Algebra, PreCalculus and Trigonometry. What could be a better fit than a program that adapts to the individual student and meets them where they are? Isn’t that one of the reasons we homeschool – so that we can help our student where they are and adapt our curricula to the individual? Here are some screen shots from different parts of the program – you really need to see ALEKS in action to appreciate all the capabilities. 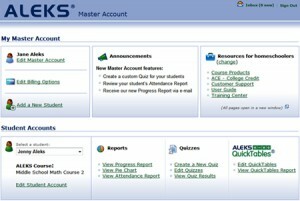 ALEKS offers several subscription options: $19.95 monthly, $99.95 for 6 months, or $179.95 for 12 months. They also offer family discounts. All of the subscription options are available directly from the ALEKS website. If you sign up, let them know I sent you! Click on the thumbnails below to see larger collages of the parent and student screens.